We are back in full gear! Both online order, DoorDash, and Grubhub! We will be open regular hours on Easter Sunday! order and pay online here with us. pick up in store. please click here to start your order. we have partnered with DoorDash FOR DELIVERIES. Kitchen closes 15 minutes prior to closing. Weekly specials are automatically deducted during online ordering. We no longer charge a corkage fee. By all means, bring your libations to enjoy with our delicious Thai dishes! Happy Hour includes $2 off all appetizers. As of January 1, 2019, we will no longer offer Happy Hour appetizers for togo orders. $2 off special will only be for dine in. Happy Hour is not valid for online ordering. Interview times are Monday-Friday, 1pm-4pm. WE LOOK FORWARD TO SPEAKING WITH YOU. Yai's Thai Kitchen is an equal opportunity employer. Through years of great family dining, we've perfected many dishes while still fine tuning many other dishes. Come in and enjoy what makes Thai food so unique, with fresh vegetables, wondrous sauces, and combinations of flavors that range from sweet to spicy. We offer an extensive menu of appetizers, such as the Thai staple Chicken Satay, where the peanut sauce is homemade and the cucumber salad is to-die-for; and the homemade Pork Dumplings, where the crispy garlic in oil heightens the dish even more. And let's not forget the ever famous signature Thai dish, Pad Thai. Throughout the few restaurants we have operated, we have perfected the dish over the years and we are excited to have you try Yai's Pad Thai. The homemade sauce with a sweetness kick is sauteed rice stick noodles, bean sprouts, and onions; this dish is sure to keep you coming back for more. Our family thank you for coming by our restaurant to have a great meal, or getting to-go, or and checking out our page. We cook with love in our little kitchen, so we thank you again! 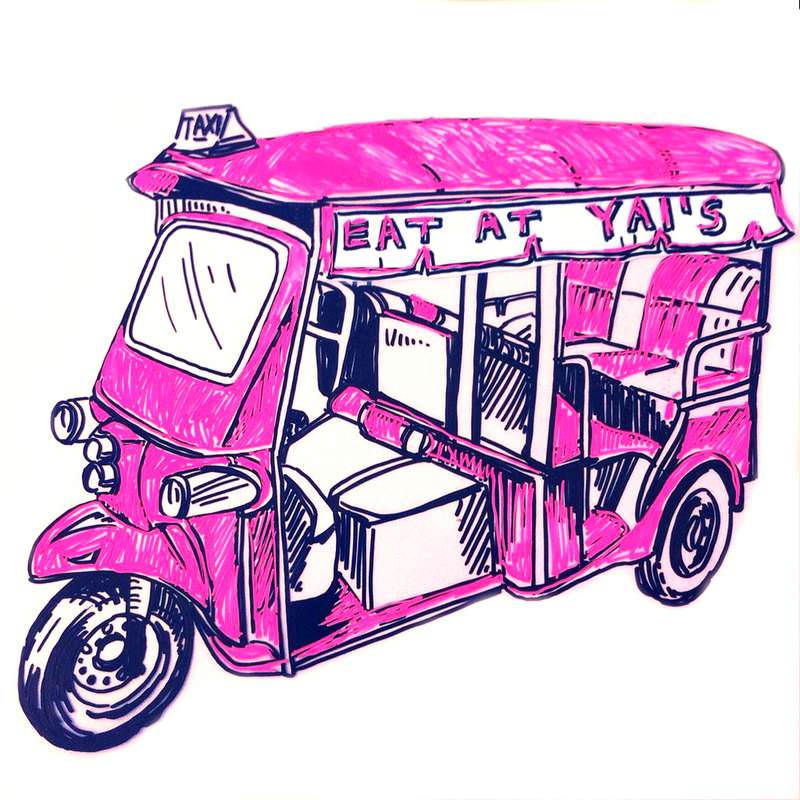 Yai's Thai Kitchen is a third generation food operation by a family that loves to cook and loves to eat. Starting with our maternal grandmother (Yai), being the first generation, of whom showed us homemade and delicious meals, and the joyous times in the kitchen. We opened our first restaurant, Bangkok Place, in Houston in 1992. Soon after, we opened the second one in the Memorial area in 1995. We then followed the third in Spring, and finally our fourth in Clear Lake in 1999. This second generation offered Houstonians our authentic Thai recipes and hospitality. The second generation restaurants were ran by the parents & family, Bangkok Place restaurants invited patrons into our family with delicious offers of Thai food and culture. Finally, our third generation, the kids growing up around all the deliciousness of Bangkok Place, is ready to tackle our vision of what our grandmother has started. We have since closed our Bangkok Place restaurants, but we are ready to start a new chapter. So, come by our restaurant, pull up a chair, emerge yourself in our modern take of wonderful Thai dishes.